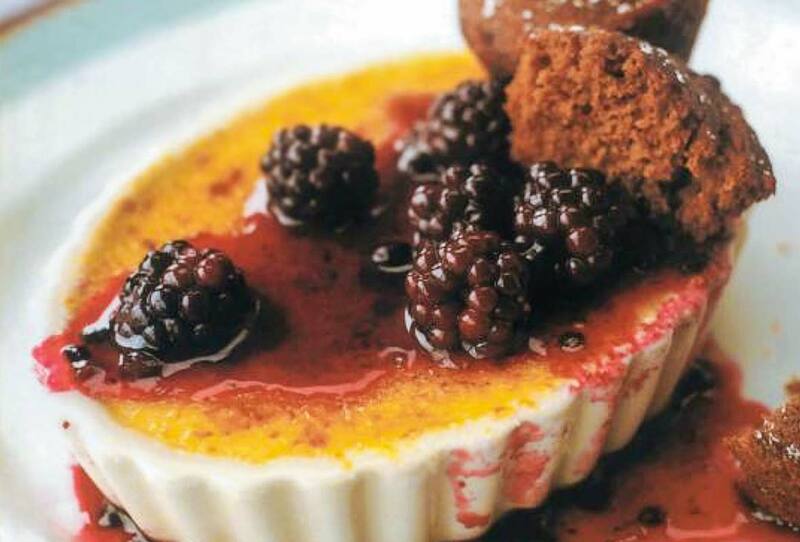 For this ginger creme brulee with blackberries, a wallop of ginger in addition to vanilla. On top are blackberries in a sweet-tart sauce. We’ve jazzed up the classic French custard with a wallop of ginger in addition to vanilla, topped with a brittle layer of sugar. The thickness of the brûlée sugar is a controversial topic. Some like it really thick; we think the sugar should be like the first freeze on a puddle, so thin you can see the custard underneath. 2. Place the cream and ginger in a small pot and bring to a boil over medium-high heat. Off heat, steep for 1 hour. 3. Place the vanilla, sugar, egg yolks, and salt in a bowl and mix to combine. Reheat the cream over medium heat and bring back to a boil. Pour the cream over the egg mixture in a steady stream, whisking all the while. Pour through a strainer and discard the solids. If desired, cool in an ice bath and refrigerate up to 2 days. 5. Sprinkle the tops with sugar and caramelize with a hand-held propane torch set on medium using short sweeping strokes. Serve immediately. 6. Using your hand, gently crush 1/2 cup of the blackberries. Place the crushed and whole berries, sugar, and lemon juice in a bowl, mix to combine, and refrigerate at least 1 hour and up to 2 days. 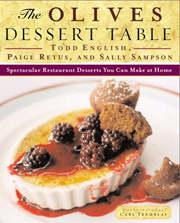 Ginger Creme Brulee with Blackberries Recipe © 2000 Todd English. Photo © 2000 Carl Tremblay. All rights reserved. All recipes and photos used with permission of the publisher.